Good start with the spinnaker up straight away. 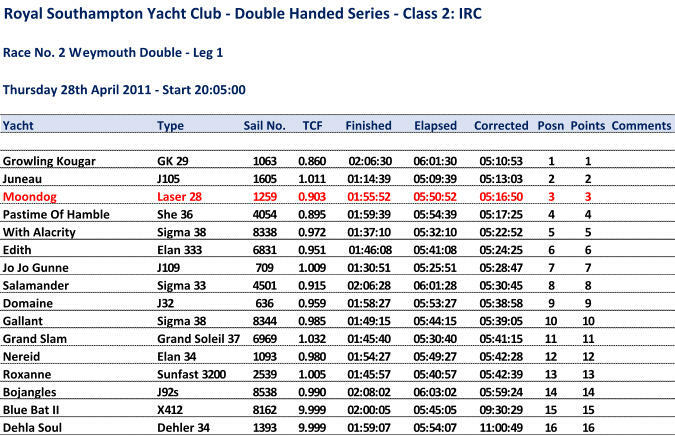 Pretty fast trip down the Solent and managed to keep up with the front for the fleet to Bridge. Angle got tighter as we progressed past Anvil Point and St Albans but managed to keep the spinnaker up till about 8 miles from the finish with only a few broaches. Bit hectic at the finish but very fast trip at under 6 hours and third place on the podium.